We understand how special and memorable your baby scan is. That's why at the studio, we have lovingly and carefully curated some items for you to cherish. Our branded USB sticks are an ideal way to remember your time with us at the studio. We will save all images obtained during your scan and present them to you in our gift boxes which are personalised stating the year your baby scan was performed. These plush bears allow you to listen to your babies heart beat. We will record your babies heart beat during the scan and place into the teddy. With a gentle squeeze of your teddies chest you can listen to the rhythm of you babies heart at any time. We love these modern scratch cards! Let family and friends join in the fun and reveal your baby's gender together. Each scratch card is supplied with its own individual envelope, an ideal gift for family and friends. Have a little fun with family and friends by popping the cannon to reveal your babies gender. 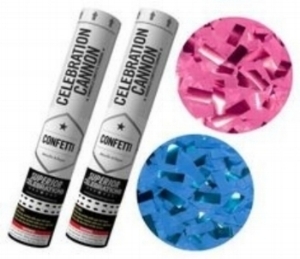 Your cannon will be filled with pink or blue confetti and on popping will release confetti up to eight feet in the air. Great fun for young and old. Ideal keepsake to give to family and friends to celebrate your special news. Pick your favourite image of baby and we will transform it into a lovely keyring.